You want to be healthy. God wants you to be healthy. Now the highly anticipated revised and expanded edition of the Bible Cure series is available to help you get healthy-body, mind, and spirit. People today need and want specifics about how to feel better, look better, and live longer, healthier lives. In each book of the Bible Cure series, readers will find helpful alternative medical information together with uplifting and faith-building biblical truths. Covering disorders and health issues common to men, women, and children today, these brief, easy-to-access books are the perfect addition to any bookshelf. 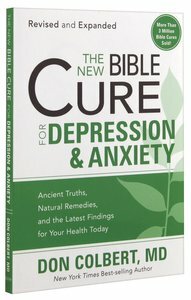 About "The New Bible Cure For Depression & Anxiety (The New Bible Cure Series)"
Order now to secure your copy when our stock arrives. Other edition is available. 9781599797601 0 Available. Expected to ship in 5 to 6 weeks from Australia.